Round-trip airfare from your city to Europe, Transportation within Europe, two meals per day, hostel or convent lodging, entrance fees, JMJ Youth guide from arrival to departure in Europe. The Holy Stairs are the stone stairs that Jesus ascended when being condemned to death by Pontius Pilate. They were back from the Holy Land by St. Helena, mother of Constantine the Great. Individuals are able to walk up or ascend on their knees while offering up their prayers and intentions. Underneath the glass on a few steps you can see drops of Jesus’ blood. 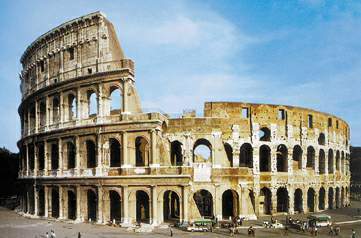 The Coliseum, also known as the Flavian Amphitheatre, was built of concrete and stone in 70 AD. It was the largest amphitheatre in the Roman Empire and is still the largest amphitheatre in the world. The Coliseum could hold between 50,000 and 80,000 spectators and was used for gladiatorial contests and public spectacles such as mock sea battles, animal hunts, executions of Christians, re-enactments of famous battles, and dramas based on Classical mythology. The inside was extensively stripped of the stone to use for other buildings in Rome, and later went through renovations. What remains of the outer walls are the original stones. The rest were also taken down to use for other building projects. Since the Coliseum is a place where Christian martyrs died, the Catholic Church has consecrated it and declared it sanctified by the blood of Christian martyrs. St. Peter’s Basilica is one of the largest churches in the world and is located on the burial site of the Apostle and first Bishop of Rome, St. Peter. Tradition and evidence hold that St. Peter’s tomb is directly below the altar. A small shrine was built on his tomb a few years later and the first Basilica built was done by Constantine the Great in the early 4th century. The present day Basilica was built between 1506-1626. St. Peter met his martyrdom when he was crucified upside down in the Circus of Nero. Christian followers buried him just outside the circus. Although the Holy Father lives in the Vatican Apartments attached to St. Peter’s Basilica, his Church as the Bishop of Rome is actually St. John Lateran. The Basilica is so grand inside, yet everything is designed as an optical illusion. For instance, there are two rows of statues. The statues on the upper level are 4 feet taller than those on the bottom, yet they look the same size. The baldachino over the altar is actually the height of a 10-story building. Among all the beautiful works of arts and treasures is Michelangelo’s Pieta. There are 150 popes buried here, including St. Peter and the late John Paul II. We always​ include opportunities for daily Mass. 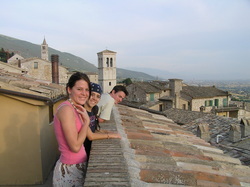 Specific locations within the daily itinerary are subject to change depending on actual travel dates. St. Peter in Chains was first rebuilt in 432-440 AD to house the relic of the chains that St. Peter wore while he was imprisoned in Jerusalem. Details about the earlier church are unknown. Pope Leo, according to tradition, was comparing the chains from Jerusalem to the chains of St. Peter’s final imprisonment in the Mamertine Prison in Rome, the two chains miraculously fused together. These chains are located in the reliquary under the main altar of the basilica.